Doctor Mark F. Dalesandro graduated the University of Texas Southwestern Medical School in Dallas, in 2010. Then, he completed an internship in internal medicine at Baptist Medical Center and a residency in radiology at Indiana University School of Medicine. 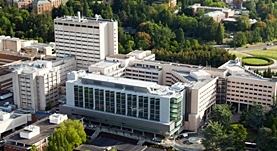 He is affiliated with Harborview Medical Center, in King County, Washington and with the University Of Washington Medical Center. Doctor Mark F. Dalesandro is also a member of the Association Of University Physicians medical group. Dr. Mark Dalesandro has contributed to 1 publications. Ciliochoroidal ganglioneuroma in neurofibromatosis type 1: Report of a case and review of the literature. Abdulkader, M. M.,Dalesandro, M. F.,Mendenhall, S. K.,Shah, M. V.,Bonnin, J. M.; Neuropathology. 1900 Jan 01.